Riding in the summer is the best. Being more soaked with sweat than you would be wet with water were you in the pool, however, is much less enjoyable. For riders who make their way in the heat of the summer, that is just par for the course. Additionally, if you want a lightweight mesh option that combates the perspiration, you are likely getting a jacket that has put less of a premium on overall protection as it will be lighter and generally favor more mesh than ardent slide protection panels constructed of solid textile or leather. All of that changes with the Alpinestars Viper Air Jacket for Tech-Air Street, however. With this jacket riders get the leather outer shell that is 1) highly abrasion resistant, 2) very comfortable, and 3) the epitome of moto-cool. At the same time, however, the Viper Air Jacket that has been designed to take the Tech-Air Street Airbag Vest also boasts capability to incorporate one of the most advanced rider protection devices on the planet (the Tech-Air Street Vest is sold separately). 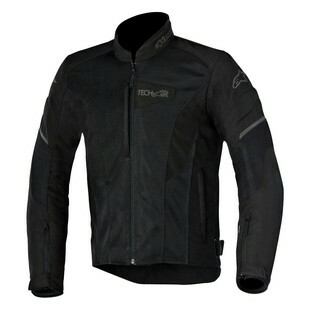 Through an interior that has been fitted with mounting points for the vest, an LED systems-check indicator on the Left sleeve, and an external shell that has been crafted to handle the rapid expansion of the vest underneath should it deploy, Alpinestars has combined a leather / mesh hot weather jacket with one of the most highly anticipated technological advancements in rider protection. Additional features of the Viper Tech-Air Street Vest include a removable windproof liner, an elongated rear profile, and removable CE-certified Bio-Armor at the shoulders and elbows.